The life of Brian: reissue of glam-rock also-rans, featuring future AC/DC screamer Brian Johnson. Like Slade, these Tynesiders had already served a long apprenticeship – in wonderfully named outfits ranging from Sneeze to Smokestack Crumble – before being put together by guitarist Vic Malcolm. However, despite their undoubted musical ability, they failed to match the commercial success of their Midlands rivals, fizzling out even before AC/DC came calling for their lead singer in 1980 (Bon Scott had been impressed by Brian Johnson’s vocal abilities while supporting with his own band, Fang, in March 1973). Listening to this 66-track, five-album box set, you can’t help but wonder if their lack of showmanship was to blame – there’s nothing wrong with the music. 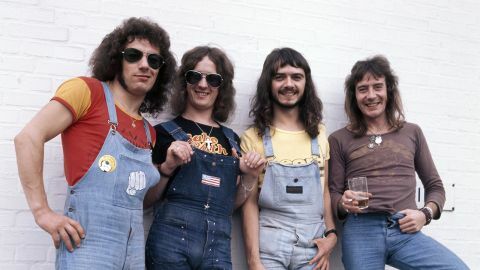 Reluctantly renamed Geordie (rather than USA) on their label’s insistence, 1973 debut Hope You Like It is a good-natured mix of blue-collar rock (Natural Born Loser), good-time boogie (Old Time Rocker) and cossack pop (Don’t Do That), complete with a bona fide Top 10 hit in All Because Of You. Despite this success, they were never comfortable in their glammy threads, and 1974 follow-up Don’t Be Fooled By The Name saw a return to their hard-rock roots. A muscular cover of House Of the Rising Sun sets the tone, and while there are some good songs – notably a Zep-esque Ten Feet Tall and lysergic lullaby Little Boy – it failed to strike a chord with teen audiences fixated on glam titans Slade, Sweet and Gary Glitter. Their final studio album, 1976’s Save The World, is a more schizophrenic affair, combining proto-metal (Fire Queen) and terrace anthems (You Do This To Me) with, bizarrely, cod calypso (I Cried Today). With punk on the horizon, it sank without trace, and Johnson soon left for an ill-fated solo career. Of the final two albums, 1978’s No Good Woman boasts five unreleased songs from the Johnson era, while 1981’s Brian Johnson And Geordie is a blatant cash-in released shortly after Johnson’s elevation to flat-capped superstar. Ironically, by then, the singer’s everyman image fitted perfectly with the post-punk zeitgeist. Proof, as Dave Hill could tell you, that it always pays to look the part.